According to Pavan Duggal, internationally acclaimed authority and expert on Cyberlaw and Cyber Security Law, who is doing pioneering work in the area of Blockchain legal issues, Blockchain Law refers to the study of law, which examines the complicated legal, policy and regulatory issues concerning the digitized, decentralized, distributed public ledgers or blocks and the data and information stored thereon as well as their interplay with human and automated activities and conduct. Collation of all legal developments/events/perspectives concerning Blockchain. Track various cases and litigations concerning the Blockchain technology. Contribute, through various activities, to evolving legal standards governing Blockchain, by organizing various related activities. BLOCKCHAIN LAW EPICENTRE HEADED BY CHIEF MENTOR AND INTERNATIONALLY ACCLAIMED AUTHORITY ON BLOCKCHAIN LAW PAVAN DUGGAL. Blockchain Law Epicentre is being headed/mentored by its Chief Mentor Mr. Pavan Duggal internationally renowned expert and authority of Cyberlaw, Cybersecurity Law, who is also doing pioneering work in the area of Blockchain Law. Huffpost references Pavan Duggal as having been acknowledged as one of the top Four Lawyers in the cyber world. 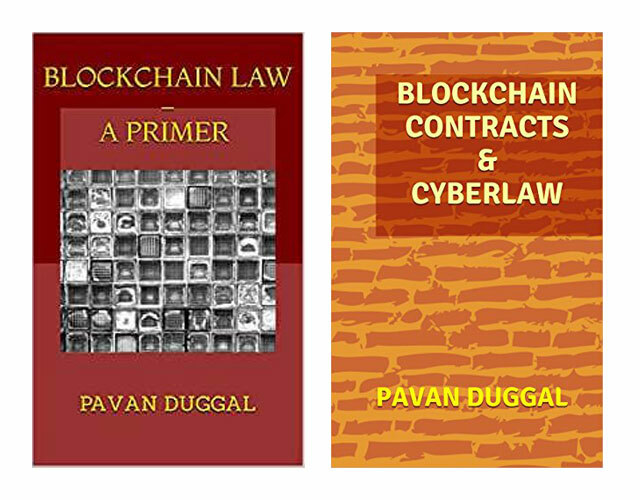 His work in Blockchain Law is manifested in his books on Blockchain legalities being “Blockchain Law- A Primer” and “Blockchain Contracts and Cyberlaw”. He has addressed various international conferences and seminars on Blockchain legalities.